The donation will establish a research fund at the USC Institute for Biomedical Therapeutics. In the spirit of multidisciplinary collaboration, the institute brings together scientists, engineers, physicians and other faculty from across the university to develop new ways to diagnose and treat diseases that cause debilitating blindness, as well as other neurosensory disorders. In recognition of the donation, the institute will be named the USC Dr. Allen and Charlotte Ginsburg Institute for Biomedical Therapeutics. The gift will support research at the institute and a biennial scientific meeting of physicians and researchers to discuss new ideas and breakthroughs. At the meeting, organizers will award the Ginsburg Vision Research Prize to the team or individual whose work shows the most promise in finding a treatment or cure for eye disease. 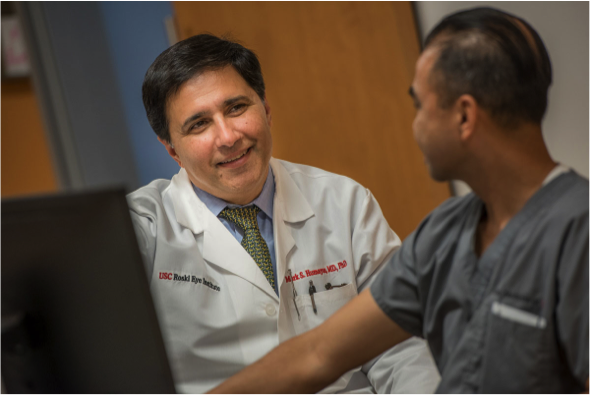 Humayun, the Cornelius Pings Chair in Biomedical Sciences and co-director of the USC Roski Eye Institute, holds joint appointments at the Keck School of Medicine of USC and USC Viterbi School of Engineering. He is a professor of ophthalmology, biomedical engineering and integrative anatomical sciences. Allen Ginsburg, a retired ophthalmologist, said the most devastating moments of his career came when he had to tell patients that they were losing their vision and would ultimately become blind. Founded in 2015, the newly named USC Ginsburg Institute grew from the National Science Foundation-funded Biomimetic MicroElectronic Engineering Center, a national center of excellence that developed implantable neural electronics. Initially focused on bioelectronics, the institute has since expanded its efforts to combine implantable and bioengineered devices with cell- and gene-based therapies and pharmacological therapies. It is jointly supported by USC Viterbi and the Keck School of Medicine. A hub of multidisciplinary innovation, the institute draws on the expertise of faculty members in the Keck School of Medicine, USC Viterbi, USC School of Pharmacy and USC Dornsife College of Letters, Arts and Sciences. It has had working relationships with more than 40 other academic institutions and corporate partners and continues to seek strategic partnerships. As members of an “institute without borders,” its researchers work with groups from around the world. After witnessing his grandmother lose her vision to complications from diabetes, Humayun devoted his career to developing treatments for eye disease. He is an ophthalmologist and biomedical engineer known for his pioneering technology to bring sight to the blind. Humayun led a team of interdisciplinary researchers to create a bioelectronic retinal prosthesis that can be implanted into the eye. Called the Argus II, the “bionic eye” became the first U.S. Food and Drug Administration-approved artificial retinal implant to treat severe retinitis pigmentosa, an inherited form of retinal blindness. The device helps people who have been blind for decades regain an unprecedented degree of useful vision. More recently, Humayun and his team developed a bioengineered stem cell-based implant for age-related macular d egeneration that similarly shows promise to restore vision. The leading journal Science Translational Medicine featured the work on its cover. His research has been recognized with numerous awards, including the National Medal of Technology and Innovation from President Barack Obama. In 2017, he received the Presidential Medallion from USC, the university’s top honor. He is the only ophthalmologist to be elected to the National Academy of Medicine, National Academy of Engineering and National Academy of Inventors. Humayun is confident that the naming gift will enable scientists and clinicians at the institute to expand their work, transforming and accelerating research advances into treatments that will help patients. The Ginsburg Institute Research Fund will provide much-needed funding for emerging projects, helping scientists gather more data that will position them for larger federal grants and other sources of external funding. Allen Ginsburg retired in 1990 after a successful career in ophthalmology. He has since focused on real estate entrepreneurship. Charlotte Ginsburg’s passions include performing arts, costume and fashion design, dance and theater. The Ginsburgs support environmental sustainability, ocean aquaculture and desalination of seawater, and are involved with the Aquarium of the Pacific, Palos Verdes Land Conservancy and Save the Redwoods. They are long-time residents of Southern California and live in Palos Verdes. 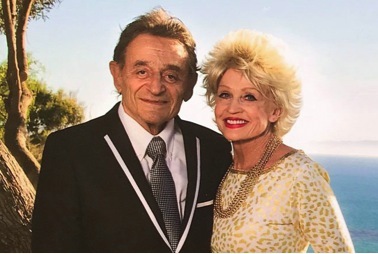 The Ginsburgs said they were inspired to name the USC Ginsburg Institute for Biomedical Therapeutics after learning about its medical breakthroughs, particularly the development of the Argus II and stem cell-based treatments for devastating eye diseases.